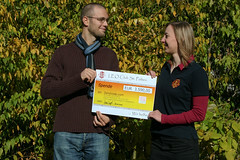 Thanks to the generous donation of € 3590,- by the Leo Club St.Pölten, the next 6-month iteration of the Zanzicode basic course is secured. The Leo Club St. Pölten is a non-profit organisation which supports social projects, usually with a regional focus in Lower Austria, Austria; with Zanzicode, they are assisting a project in a foreign country for the first time. With the help of the donation, we have the means to continue our work in Zanzibar and to steadily move our project forward. Thanks a lot, Leo Club — your help is most appreciated! Late as always, I hereby provide you with the resumé of the final quarter of 2009 – from November 2009 to January 2010. The first event after the last quarterly review was a really significant one – the World Bank Day @ mHealth Summit at 26 October 2009 – another event organized by our partners from the eDevelopment Thematic Group (eTG) of the World Bank. We blogged about it very detailed – with six posts – and covered it on Twitter. In November Hello Africa continued to tour the world with a screening in Wales at the May You Live in Interesting Times festival. Later that month we covered the Development Marketplace 2009 event, where “100 ideas to save the planet” were presented, with roughly a quarter of them being funded by the Global Environment Facility, the foreign ministry of Denmark, the International Fund for Agricultural Development and the World Bank Group. Oliver, our man in Germany took part in the World Social Web Dialogue in Berlin, which aims to create a standard for exchanging data between NGOs. Furthermore I attended events of the Austrian NGO Südwind – Clean IT – the way to a fair trade PC and one monthly meeting of theirs, focusing on Web 2.0 and new technologies. That was already in December though. December also started with a very nice present of Oliver Ruhm, designer at Zeughaus Brand Identity Desig, who rebrushed our page design. Except the Donate-button on the top it’s not implemented yet as we all are very busy, but if somebody would be willing to volunteer for that, we’d be grateful! Thanks to Fritz who was as a teacher in Zanzibar, later that month the homepage and blog for our web application programmers school in Zanzibar – Zanzicode – went online. You can read about the progress of our pupils there – though we’ll update you here on the blog as well. The eTG organized an event in December focusing on free and open source software, with Brazil as example. Another event we attended was 26c3, the hacker’s conference of the Chaos Communication Club. January does not seem so stressful on the blog – with only a review of Bamboo, Tin and Callabashes, an exhibition in the Leopold museum in Vienna and the eTG event on climate smart development – but actually it was a very stressful month with many things happening internally. We had a big meeting with Martin T, Martin K, Paul, Oliver, Fritz, me (Florian) and even two new members – Thomas and Isabella – taking part. Also, we are working on grant applications, scientific papers, new events and our internal structure – more details to be announced when the time is ripe. February has just started – but we are looking forward to our next Stammtisch next Thursday – and hope to see a lot of interested people there! A lot of things to come, and we are still motivated and eager for new challenges. While Martin Konzett was in Zanzibar, he screened our movie Hello Africa at ZIFF (Summary of ZIFF by Dan Hamm), made some valuable contacts and set up our Zanzibits Support project which is now running with Dan Hamm and Fritz Grabo as teachers. Our volunteer Wambura Kimunyu attended M4Change Nairobi and wrote a blopost about it – Thoughts from M4Change Nairobi. Worlali Senyo, our volunteer from Accra helped us cover the efforts in Ghana towards more broadband for everybody – with posts on AfNOG EO Localiazation Workshop and Ghana to Develop a National Broadband Strategy. In October we were already present at two events – Africa Gathering in London, and May You Live In Interesting Times in Cardiff, where our movie Hello Africa was screened – once again. Concerning Hello Africa there’s more great news – it made it to archive.org. Also our partnership with the World Bank eTG group moved forward, we covered two workshops. Now we are preparing the next interesting event focusing on the potentials of mHealth – “World Bank Day @ mHealth Summit” on 28. October. For the future we are planning to collaborate more with OLPC Austria in our efforts to create an ICT4D scene in Austria and some ICT4D-related events. So, a lot of things are happening in ICT4D and we are excited to be a part of the whole scene. Looking forward to the next months. Again three months (actually four … but its been busy times) have passed since our Internal #Q1 2009 blogpost and we can again make a resumé what has happened since then. Our partnership with the eDevelopment Thematic Group of the World Bank resulted in us covering several workshops ranging from open standards to cloud computing, via blogging and Twitter. We attended e-STAS in Malaga where we moderated a workshop and AfricaGathering in London where we showed the trailer of our movie. Both events were great and we met up with numerous incredible people with great ideas. Our biggest success so far was the screening of our movie Hello Africa at Viennese cinema Schikaneder in May and the subsequent screenings and the online streaming of it. The cinema was full, we got great feedbackand people from all around the world (UK, USA, Uganda, …) contacted us to get a copy. This Sunday the movie will be shown at ZIFF in Zanzibar. Another quite successful event that took place twice in the last four months was the ICT4D.at Stammtisch. As our members are spread around the world during summer, we are not sure if we will hold one then, but afterwards we will caryy on for sure. Generally – every first Friday a month at Cafe Benno, but we will announce that anyway. Organizationswise we are happy to have attracted new members – Paul Pöltner who will help us to align our organizational structure to become more efficient and Worlali Senyo (Ghana) who reviews papers and does research on how to extend our projects to Ghana. Furthermore Wambura Kimunyu (Kenya) claimed she would give us a hand covering conferences in and around Kenya. Of course I also want to mention our members who have been already there longer – you have done great work. Out next steps during the summer are partially already taking place – Martin Konzett is currently in Tanzania and Uganda to meet people and carry forward our projects – and for ZIFF of course. I, Florian Sturm, will go to Ghana in two weeks for the same reason and to show our movie at Maker Faire Africa. We haven’t managed to successfully apply for a grant yet, but we are getting ready for it. Martin will try to attend some conferences (e.g. IPID or Mobile Tech 4 Change) and will definitely go to INTERACT 2009. Furthermore we are of course trying to keep up our good work with blogging and the ICT4D.at video podcast. So, great four months again. Looking forward to the summer. So far we didn’t stop blogging and pushed our video podcast forward. We went to SocialBar Wien and AfrikaCamp in Vienna, which we supported with money and own contributions. We were present at AfrikaCamp with 7 people, made interviews for our video podcast and socialized with other attendees. Later – in February – we went to Spain to attend Coop 2.0, a meeting dedicated to innovation in ICT4D. Anders Bolin, Florian Sturm and me (Martin Konzett) created good connections to several people in the international ICT4D scene and again shot interviews for our video podcast. We talked to Oleg Petrov from the e-Development Thematic Group (e-TG) of the World Bank about a possible partnership and had an own presentation about Web 2.0 in ICT4D organizations. Since ICT4D.at founding member Martin Tomitsch now started lecturing down under, we are now offically partnering with University of Sydney. This is the second university partnering with us – the first one is Vienna University of Technology. We already rolled out our first cooperative article (ICTs for the empowerment of citizens) which is going to be printed for the meeting e-STAS in Malaga, where I will be going to by the end of this month. We also fixed our contribution for Africa Gathering in London the end of April. Out movie project UZI Africa has rolled out a second trailer for scientific use. We are proud to welcome Joanna Knueppel in our team. She will take care of the upcoming applications for funding together with Petra Busswald. We have three to five grants in the pipeline to which we will aplly by the end of April. As Joanna is an English native speaker, she will also do quality engineering on our blog and wiki. 2 of our members are starting the Swahili Course with Elisabeth Zenz this week to be prepared for Zanzibar this summer where they will carry out the Zanzibits Support project. The Swahili Course will also be documented and there will be a weekly blog post about it. So far so good – we hope everything will continue this smooth and are looking forward to the next exciting events.